USA Flights, Restriction and Banned to Powders. First they came for our shampoo, now they come for our talcum powder. Travelers on international flights to the United States will face increased detection of powdered substances in handbags, effective June 30. A spokesman for the Transportation Security Administration said yesterday that the change applies to passengers carrying more than 350 milliliters of gunpowder, reports AP. That's about the same size as a can of carbonated drink. Those who carry large amounts of dust - including cosmetics, coffee grounds or other food items - may have their bags open and tested for explosives. It is recommended that quantities above the 350-milliliter limit be stored in checked baggage and that smaller quantities be removed from handbags for better X-ray vision. The policy was promulgated in part in response to a frustrated bomb plot on an Etihad Airways plane that was flying to Abu Dhabi from Sydney last July. The TSA said that additional screening was already underway for domestic flights in the United States. Although this last safety effort is not an absolute ban, a traveler could risk discarding larger quantities of dust before boarding a plane, a situation not ideal if you carry powdered milk for babies or if you have been buying spices in Morocco. 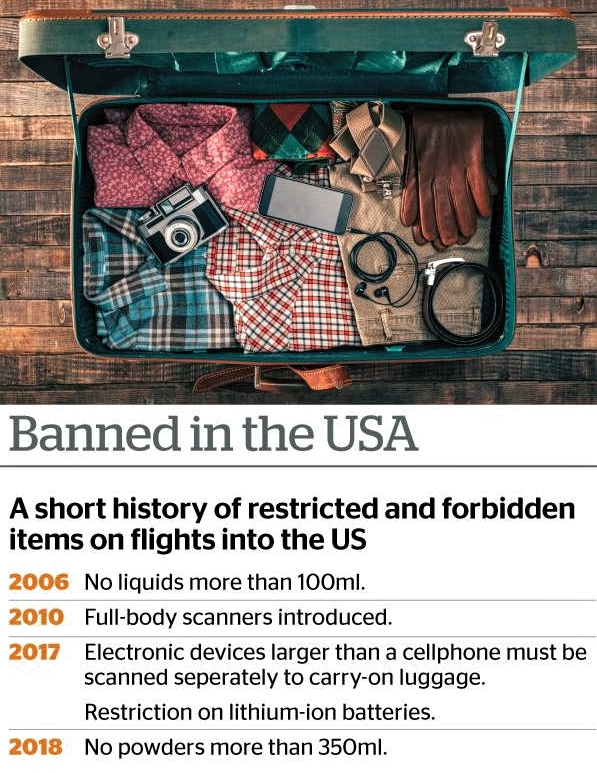 "We encourage people to get rid of certain items, especially organic items, to get a clearer picture of what's going on inside the bag," said Mike England, a TSA spokesman to USA Today. "It's something we advise people to do, we're asking our foreign partners to do what we're already doing at the national level." While the concerns of the agency's main agency of interest were the materials that could be used to build an explosive in flight, they also identified fentanyl and pepper powder in the cabin as a potential threat. While the TSA publishes a list of what is allowed and prohibited on its website, it has not yet updated its rules for powders with the new limit of 350 milliliters. This is the most recent change to airport security in the USA After September 11. In 2006, a ban on liquids of more than 100 ml in carry-on luggage was launched after a failed pump plan. Full body scanners were introduced in 2010, after a terrorist in underwear tried to detonate an explosive device on a flight from Amsterdam to Detroit. Last year, travelers were asked to remove electronic devices larger than a cell phone for security screening. Lithium-ion batteries were also restricted in carry-on luggage due to fear of battery fires. As expected, the new restrictions could cause more delays in the security lanes as agents and passengers adjust to the changes. "Whenever there are new requirements, there are decelerations at the checkpoint during the transition period," Gary Leff, author of the aviation blog View from the Wing, told the New York Times. "During the week you have more regular travelers who adapt more quickly, then you tend to see slowdowns during the holidays, since those who fly less frequently, exceed previous expectations, discover that they carry something that they no longer allow that triggers a secondary inspection, and slows down the line. "